Heading into the town of Moab is like pulling into a giant drive-through REI with all of the adventures right outside the door. The town is chock full of adventure companies offering multiple flavors of river rafting, bike riding, Jeep and Humvee tours, helicopter rides, rock climbing, sky diving, camping... if it's an outdoor adventure, you can do it here. However, it was uranium that first put Moab on the map in the 1950's when a guy named Charlie Steen discovered it there, and made millions by selling the ore to the government. He went nuts with his riches and built an impressive cliff-side house at the edge of town, where he used to throw parties for the residents, many of whom worked in his mining business. He was also known to fly planes equipped with antennae over the house at night to get better television reception and take off to nearby states for lunch on a whim. Apparently he blew his millions and now lives quietly somewhere in Colorado. Nik and I went out on a bike shop reconnaissance mission early the next morning, looking for a good used bike to buy, since we were one short. 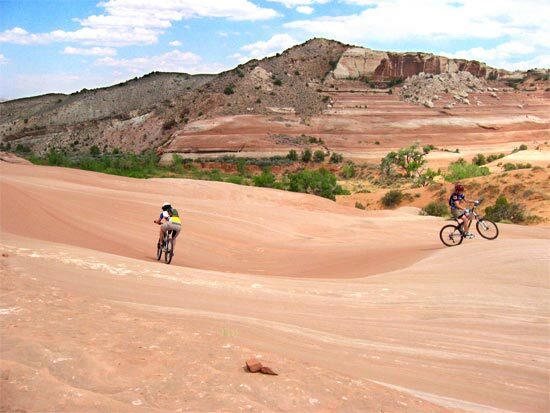 A town of this size might typically have one little bike shop, but Moab has at least 4 great shops and lots of the motels and adventure companies advertise that they also have bike shops on the premises, an indication of how big the bike business is here. Poison Spider Bike Shop caught our fancy, had a couple of great bikes and the guys there were pretty cool, so we went with them. Riding the Moab slick rock - The famous Slick Rock, Poison Spider and Porcupine Rim trails are like double black diamond runs, highly technical and kinda scary, so we hoped to start with something less demanding and death defying. The mechanic at Poison Spider told us to check out Bartlett Wash, about 15 miles north of town, for some fun, family oriented riding in something akin to a natural skateboard park. We were informed that others had driven busses out to the wash and bravely headed out with no way to turn back until we got to the end. The bus rambled down the 5 miles of narrow rugged jeep trail, over hill and dale, bogged down in a couple of sandy stretches that caused momentary panic and dragged the back end a few times, putting a nice curve on the bottom of the aluminum ladder that led up to the deck, but I managed, in a full sweat, to keep the momentum and plow through to a shady spot near the end of the road. Whew! We got the bikes down, filled our CamelBaks with precious water and headed out onto the shadeless, oven-like slick rock. Getting up on the rock was a bit tough, since we had to drag our bikes up a very steep rock wall about 20 or 30 feet high, but once up there, we rolled around and got the feel for the unique sandpaper covered rock. It was tough for little Zoe, though, who quickly ran out of water and pooped out in the 90+ degree heat, but that was probably a good thing since we didn't really want to be out there much longer than a couple of hours, especially with the buzzards flying overhead. Towards the end of the ride, Jereme had to show me how to drop off a ledge into a bowl, since clearly I was riding much to conservatively to have fun. Ironically, Jereme took the drop too slowly, tried to put his foot down mid-drop and fell on it, straining his ankle severely enough that he could barely get back to the bus. A trip to the local hospital revealed that it had only been strained, nothing torn or broken. He could probably still go rafting tomorrow. Although the hospital was small and quiet when we arrived late in the day, we were informed that we missed the 'rush hour'. Adventurers like us apparently keep this place very busy. Word of mouth - There are tons of books, brochures and maps covering what to do in and around Moab, and you can hire a guide to take you just about anywhere, but word of mouth is still the best bet, especially from the locals. Billy at Poison Spider told us to call Red River Rafting company for a Colorado River rafting trip that we planned for the next day and Theresa at Red River recommended the nice little Portal campground nearby, which had a wonderful swimming hole and gave us a 15% discount for getting the recommendation. The next day our river guide, David, recommended an excellent pasta & pizza restaurant in town and everyone was happy. If you venture out here, ask the locals where to go and you're sure to have fun. That was pretty brave, driving the behemoth out into the sandy washes. Another thing for your list of future improvements: a winch and a tow strap!